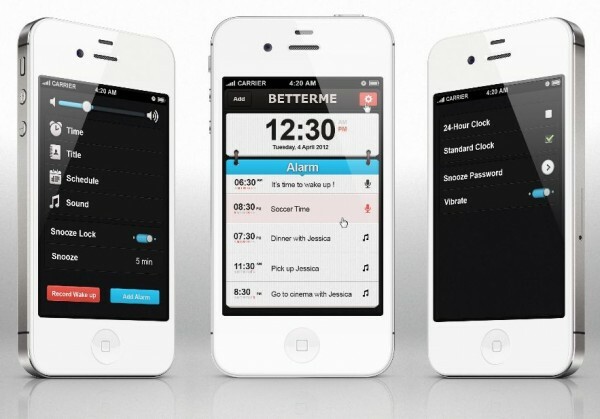 BetterMe, developed byAbraham Agopian, is an iPhone application that is for people who look for any way to better themselves. The app uses the fear of social scorn to help someone jump out of bed in the morning. The basic concept of BetterMe is to not be lazy and hit the snooze button. If you decide to hit the snooze button, BetterMe will post a message on your Facebook wall telling everyone that you were too lazy to get up in the morning. BetterMe is the perfect formula for a better morning. This application has a super nice graphics interface (GUI). The layout of everything is very well done and super easy to navigate. When you first launch the app you will be asked to log into to your Facebook account. If you don’t have one you can just hit cancel, but then again why are you using this app? It could be because it is still an awesome alarm application. Anyways, you can always turn the option off for posting on your Facebook timeline. Other settings include the ability to choose from a standard and 23-hour clock as well as a vibrate option. When you add a new a new alarm you can set the name, time to wake up, which days you want the alarm on, and even pick a wake-up tune from your music or ringtones. One really neat feature is the ability to record a custom wake-up sound right from the app. So if you want to start bettering yourself the first thing in the morning, Check out BetterMe on the Apple App Store. It is a FREE application so check it out!